VANCOUVER, Nov. 30, 2016 /CNW/ - Aurora Cannabis Inc. (the "Company" or "Aurora") (TSXV: ACB) (OTCQB: ACBFF) (Frankfurt: 21P; WKN: A1C4WM) is pleased to announce that it has broken ground, and initiated construction on an unprecedented 800,000 square foot production facility. To be known as "Aurora Sky", the new hybrid greenhouse facility, with a footprint larger than 16 football fields, is expected, on completion, to be the largest, most advanced and most automated cannabis production facility in the world. Situated on 30 acres of leased land in Leduc County, Alberta, management anticipates Aurora Sky to be capable of producing in excess of 100,000 kilograms of high quality, low cost cannabis per year. The location of the new facility provides unrivaled access to transportation, industrial infrastructure, power, water, gas, and courier services. The Company, which currently operates a 55,200 square foot purpose-built facility in Mountain View County, Alberta, has selected a closed-system, hybrid greenhouse concept of Dutch design for the expansion. This system will give Aurora's cultivation specialists precision control over all critical environmental variables to ensure production quality is consistent with the Aurora Standard. The high level of automation at Aurora Sky, management believes, will provide for ultra-low per-gram cost of production. In addition, the modular nature of the design will allow for a rapid construction process, minimizing the risk of potential delays, with completion of the new facility targeted for October of 2017. Construction of the facility's pre-engineered structure has been underway in the Netherlands since October, 2016. "Our objectives are very clear: to build the largest production capacity, with the highest production quality and the lowest production cost," said Steve Dobler, P. Eng., President. "We spent the past year evaluating and selecting the world's best design concept for cannabis production on a massive scale. We are confident that the Aurora Sky project will achieve all of our key objectives, and further establish Aurora as an innovator and world leader in the cannabis sector." 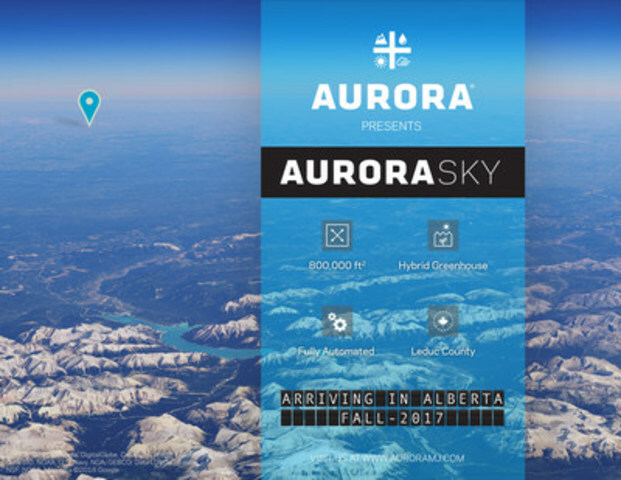 The Aurora Sky project team includes designers and suppliers with impressive track records from the very best greenhouse projects around the world, collectively holding several patents and protected design integration techniques, including Larssen Ltd, KUBO, Verkade, PDI, PB Tech, Codema and PRIVA. Forced air, bottom-fed positive pressure grow facility with supplemental sun through a specialized glass roof, optimizing micromole levels for cannabis health and yield. The latest in anti-reflective and diffusion glass technologies resulting in greatly reduced fan leaf shadows. Meticulously placed glass in a 4-sided rubber gasket system, minimizing heat and CO2 loss, while eliminating odor escape. Self-cleaning glass with snow melt technology, providing 365-day optimum supplemental sun. All steel in facility will be white powder coated for maximum reflection and GMP compliant cleanliness. A separated condensation system to remove humidity issues common to cannabis growth. Exterior walls with the optimum combination of insulation and light penetration. Rainwater harvest and full re-use technology with the latest UV and mechanical filtration technology. Unique heating and cooling systems for climate uniformity, which balance temperature, air flow and humidity to avoid vapour pressure deficits. Double, self-adjusting, wire driven screens for maximum energy savings, plant protection and 99.9% effective blackout. Highly flexible, component-based, multiple-stage water filtration, irrigation and nutrient delivery with full recirculation and cultivar-specific feeding systems. Fully automated, mobile platform growing system ensuring plants are positioned optimally for climate, irrigation, light, and growth at all stages. Deployment of cranes and conveyors throughout the facility, providing efficiency and a safe work environment for employees. Latest lighting technology with hybrid HPS and LED installation. Establishment of the world's first industrial scale Plant Tissue Culture process specific to cannabis. Concurrent with construction of Aurora Sky, the Company will be proposing a significant, additional production and processing expansion at its existing location near the Village of Cremona, in Mountain View County. On November 23, 2016, after four months of discussions, community engagement and four public meetings hosted by Aurora, the municipal Council of Mountain View County approved a re-designation of Aurora's current property as a Direct Control District, allowing for the option to expand, subject to Council approval of development plans. The proposed Mountain View County expansion, would be devoted, in part, to the establishment of a centre of excellence for the propagation of cannabis starting materials for the Leduc County greenhouse and Health Canada licensed home growers. It will also allow for additional cultivation of high-demand medical cannabis strains, large scale expansion of Aurora's processing of cannabis oils and other derivative products, as well as high-technology upgrades to the Company's packaging operations. "It is important to us that we expand responsibly in Mountain View County, where the Aurora story began," said Terry Booth, CEO. "Having now received re-designation approval from Council, we will continue with plans to increase and enhance our presence in the County, with additional investment, employment and economic development. Our rate of growth, with rapidly increasing demand for Aurora's high quality cannabis products, clearly justifies our expansion in both Mountain View County and Leduc County. The Aurora story, and our contribution to the Alberta economy, will now continue to evolve in at least two jurisdictions in this province." Aurora's wholly-owned subsidiary, Aurora Cannabis Enterprises Inc., is a licensed producer of medical cannabis pursuant to Health Canada's Access to Cannabis for Medical Purposes Regulations (ACMPR) and operates a 55,200 square foot, expandable, state-of-the-art production facility in Mountain View County, Alberta, Canada. Aurora trades on the TSX Venture Exchange under the symbol "ACB". This news release contains certain "forward-looking statements" within the meaning of such statements under applicable securities law. Forward-looking statements are frequently characterized by words such as "plan", "continue", "expect", "project", "intend", "believe", "anticipate", "estimate", "may", "will", "potential", "proposed" and other similar words, or statements that certain events or conditions "may" or "will" occur. These statements are only predictions. Various assumptions were used in drawing the conclusions or making the projections contained in the forward-looking statements throughout this news release. Forward-looking statements are based on the opinions and estimates of management at the date the statements are made, and are subject to a variety of risks and uncertainties and other factors that could cause actual events or results to differ materially from those projected in the forward-looking statements. The Company is under no obligation, and expressly disclaims any intention or obligation, to update or revise any forward-looking statements, whether as a result of new information, future events or otherwise, except as expressly required by applicable law.